It is becoming a critical time in the government's proposal for the redefinition of marriage. On 5th February, there will be the first vote on the matter in the House of Commons. It would be ideal if representations to MPs were submitted before this time. This is best done by writing to your MP at the House of Ciommons. Alternatively an e-mail can be sent, but may have less impact. Details of who your MP is, and how to get in touch, can be found on the House of Commons website. In addition, if you have not already done so, be sure to sign the on line petition at Coalition for Marriage. It can easily be found on line. This is advanced notice that this year's polgrimage in honour of St Margaret Clitherow will take place on Saturday 4th May. In the past, the event has taken place around 26th March, the feast day of St Margaret Clitherow, but this year, that would be uncomfortably close to Palm Sunday. The format will be similar to previous years, with a Solemn Mass in St Wilfrid's Church, York at 1.30pm followed by a procession through the city, and ending with Benediction and veneration of the relic at English Martyrs Church. There are other meetings in Leeds and Sheffield. Anyone wishing to attend must book in, as refreshments will be provided. Booking can either be at the local church, or by telephoning Saul Smeaton on 020 7820 3126. ﻿Please note that, although this is a regular Mass, Mgr Heslin will be away for most of the month of February, and consequently there will be no Mass on 10th, 17th and 24th February. No further Masses are expected to take place at the church of St Alphonsus at North Ormesby in Middlesbrouygh. In researching the last two posts, I came across some information which is worth posting. It concerns Bishop Robert Morlino of the Diocese of Madison in the USA. Bishop Morlino insists that every one of his seminarians receives tuition in celebrating Mass in the usus antiquior. He is taking a somewhat stiffer position than is being asked for by the Pope, or indeed by anyone I know in this country. The Pope is merely asking that seminarians are given the opportunity to learn the older form, whereas Bishop Morlino is insisting that they become competent in it. Let us look at the consequences. The Diocese of Madison has no less than 35 seminarians studying for the priesthood. This compares with, I believe, four in the Diocese of Middlesbrough. That is more than eight times as many. Surely there is a lesson there! It should be noted that the students at Oscott merely asked for Mass in the usus antiquior to be celebrated from time to time in their seminary. They did not ask, as far as we know, to be taught how to celebrate Mass in that form. However, this is something that they would have been perfectly justified in asking. Ordinaries are asked to offer their clergy the possibility of acquiring adequate preparation for celebrations in the forma extraordinaria. This applies to seminarians, where future priests should be given proper formation, including study of Latin and, where pastoral needs suggest it, the opportunity to learn the forma extraordinaria of the Roman Rite. There are two points made here. Firstly, bishops are requested to provide all clergy with the option of learning the older form of the Mass. 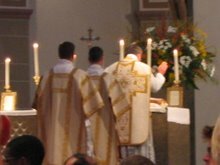 Secondly, if there are pastoral needs, bishops should provide seminarians with tuition in Latin, and the option of studying the older form of the Mass. It seems that, through the rector of Oscott College, the bishops of the Midlands and the North are, not only saying that the students cannot have Mass in the older form at their college, but also that they are not prepared to to assist in their acquiring the skills necessary to celebrate the older form when they are ordained. The action taken in both these cases is contrary to the expressed wished of the Holy Father. It has recently come to light that a group of students at Oscott College, the seminary that serves most of the dioceses of the Midlands and the North of England, made a formal request for Mass to be celebrated at least occasionally in the college in the usus antiquior. It seems that this request was made back in February 2012. 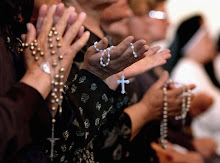 The request resulted in the matter being discussed later at a meeting which included members of the seminary staff and an advisory group of bishops. The upshot of this meeting was a decision that the priority for Oscott College should be to train seminarians in the Ordinary Form of the Mass, and that the Extraordinary Form was not to be celebrated at Oscott, although seminarians were free to experience the Extraordinary Form where it is provided in the Archdiocese and elsewhere. It seems that, as a matter of policy, students of Oscott College are not being allowed to "experience" the older form of the Mass at at the seminary, but instead are being allowed to seek it out elsewhere in their own free time. Since the closure of Ushaw College, Oscott College is where most students for the priesthood destined to serve in the Middlesbrough Diocese can expect to be trained. Consequently, this is a matter of direct interest to the faithful of the Middlesbrough Diocese.